Yesterday I woke up to cloudy skies. I was hoping to get outside for some yard work, but I dawdled around the house too long, writing about the best chocolate cake ever. Before I knew it the clouds opened up and dumped rain all over everything. And they continued to do that until the afternoon. Since it was thunderstorming, oatmeal sounded really good for breakfast. Benzo was home and OYB was also at our house (he’s been staying with us a few days). So I decided to have an impromtu oatmeal bar for the three of us. 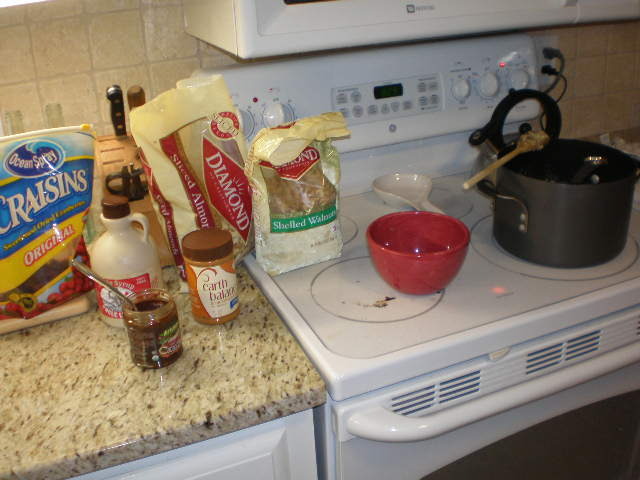 I made a bit pot o’ oatmeal and set out every topping and add-in I could find in the pantry, fridge and freezer. You could put them in pretty bowls and dishes, but since I was cooking for two men I didn’t bother. I knew they wouldn’t notice and then I’d just have more dishes to wash! Combine all ingredients in a large stockpot over medium high heat. Bring to a bubble but not a complete boil. Reduce heat to low and stir frequently until thickened. 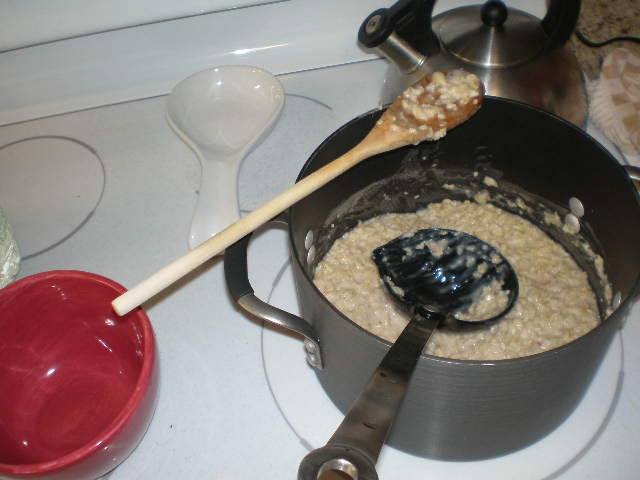 Once the oatmeal is done, keep the pot on low heat and dunk in a soup ladle for serving. Set out all the add-in options along the counter, along with a stack of bowls and spoons. People can serve themselves at their leisure. Makes for a fantastic lazy weekend morning. 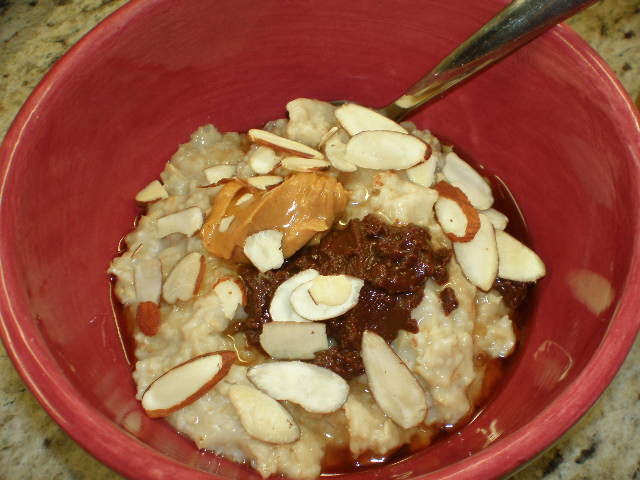 I’ve read that you can also cook oatmeal in a crockpot overnight, so that is an option if you don’t want to cook it in the morning. Everyone can personalize their oatmeal however they wish. I enjoyed a scoop of peanut butter, a scoop of Cacao Bliss, a drizzle of maple syrup and a sprinkle of sliced almonds in my bowl. It was really delicious. The peanut butter over powered the Cacao Bliss though. I could barely taste it! This would be a super easy breakfast to make for a large group of people. I’m thinking holidays, when the weather is cold and big gatherings are frequent. It literally took me 15 minutes to pull it all together. OYB went on and on about how much he loved his oatmeal mix. He even commandeered one of the leftover bowls this morning, doctored it up and took it off to work with him. So I think the oatmeal bar was a hit! Mmmm I love throwing a bunch of things into my oatmeal!